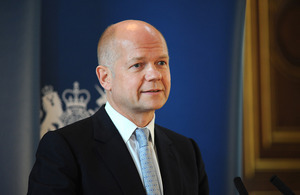 "We are determined to carry out our legal obligation to see Julian Assange extradited to Sweden" said Foreign Secretary William Hague today. “We are disappointed by the statement by Ecuador’s Foreign Minister today that Ecuador has offered political asylum to Julian Assange. “Under our law, with Mr Assange having exhausted all options of appeal, the British authorities are under a binding obligation to extradite him to Sweden. We must carry out that obligation and of course we fully intend to do so. The Ecuadorian Government’s decision this afternoon does not change that in any way. Nor does it change the current circumstances in any way. We remain committed to a diplomatic solution that allows us to carry out our obligations as a nation under the Extradition Act. “It is important to understand that this is not about Mr Assange’s activities at Wikileaks or the attitude of the United States of America. He is wanted in Sweden to answer allegations of serious sexual offences. “His case has been heard in our Courts. Following the court decision of 30 May this year, he exhausted all legal options available to him in the UK to prevent his extradition to Sweden. He then entered the Ecuadorian Embassy in London on 19 June. And since then we have worked patiently with the Ecuadorian authorities, both in London and Quito, in private discussions to seek a mutually acceptable resolution to this situation. We have held seven formal discussions as well as many other conversations. “Given our need to fulfil our obligations under international law to deliver a suspect for questioning on serious offences, we have ensured that the Ecuadorian authorities have a complete understanding of the full legal context in this country. “It is a matter of regret that instead of continuing these discussions they have instead decided to make today’s announcement. It does not change the fundamentals of the case. We will not allow Mr Assange safe passage out of the UK, nor is there any legal basis for us to do so. The UK does not accept the principle of diplomatic asylum. It is far from a universally accepted concept: the United Kingdom is not a party to any legal instruments which require us to recognise the grant of diplomatic asylum by a foreign embassy in this country. Moreover, it is well established that, even for those countries which do recognise diplomatic asylum, it should not be used for the purposes of escaping the regular processes of the courts. And in this case that is clearly what is happening. “Ecuador has expressed its concerns about the human rights of Mr Assange and sought guarantees from us in that area regarding his extradition to Sweden and indeed about any onward extradition and we have painstakingly explained the extensive human rights safeguards built into our law. “No-one, least of all the Government of Ecuador, should be in any doubt that we are determined to carry out our legal obligation to see Mr Assange extradited to Sweden. He faces serious charges in a country with the highest standards of law and where his rights are guaranteed. We believe that should be assurance enough for Ecuador and any supporters of Mr Assange.